For the second time in three starts, Cole Hamels was spotted a lead. And for the second time in three starts, he couldn’t hold it. This time, it was in a 4-3 loss to the hated Mets. Hamels continues to muddle through a very bizarre 2013. He’s gotten decent run support in his last few outings, but he just can’t seem to hold the lead. This is something that is becoming too common for a guy you look to to be the anchor of the rotation. – It’s been a down year for Hamels, to say the least. Perhaps feeling the pressure of a new contract, Kid Cole just hasn’t looked his usual, dominant self. Again tonight, he wouldn’t pitch terribly. But he wouldn’t pitch great either. -Hamels’s trouble inning came in the fifth. With runners on second and third and two outs, Eric Young came to the plate with the Phils up 3-1. Young had hit two balls sharply off Hamels in his previous at bats, including a double. A single and the game would be tied. With the count even at 2-2, Hamels went to his four-seam, despite the fact that he had been getting guys out with his changeup all night. Perhaps overthinking the situation, he’d get burned. Young grounded one sharply up the middle and the game was tied. – I like Hamels a lot and truly believe this first half is an anomaly. But it was quite peculiar to me that he opted not to go with his changeup there. It’s just another in a series of strange events that have made up Hamels’s lackluster starter to 2013. It may be nitpicking, but I feel like Hamels has to get out of that jam facing the unimposing Young, who has a career .668 OPS . – The Mets would get another two-out run in the sixth on a double to make it 4-3. Here’s a foreboding stat: Hamels has been given a lead in five of his starts this year. He’s lost every single one. For the tenth time in sixteen starts, Hamels wouldn’t pitch beyond the sixth inning. His final line: 6.0 IP, 7 H, 4 R, 4 ER, 3 BB, 5 SO. He’s now 2-11. – After an uneventful bottom of the first, Ryan Howard and Domonic Brown led off the second with back-to-back doubles to give the Phils their first run of the game. Brown would come around to score on a fielder’s choice by Ben Revere. They’d get another run in the inning before it was all said and done. – Just like in the second, Howard led off the fifth with a double. As our own Ian Riccaboni outlined, Howard has been pretty darn good over the last month and that would continue tonight. Unfortunately, his effort in the fifth would be squandered, as the Carlos Ruiz lined out to center with the bases loaded to end the inning. It was the second time the Phils stranded a runner who was on second with nobody out. If stranding baserunners counted for something, the Phillies would be a powerhouse. They stranded ten tonight. The score a few early and shut it down act is getting old. – Despite moving down in the lineup, Revere also had himself a pretty nice night. He went 2-for-4 with an RBI and a run scored, and, in the most Ben Revere thing ever, his two hits came on the infield. He continues to be an asset and was one of the bright spots for the Phils tonight. – Well, if you were hoping for a repeat performance from 2012 when Chase Utley returned from the DL, you’ll be disappointed. He didn’t homer in his first at bat. In fact, he didn’t even get a hit. He’d go 0-for-5 with a strikeout. He did hit the ball hard a couple of times. Still shaking the rust off, I guess. 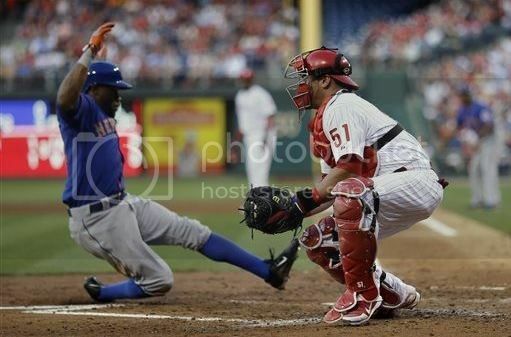 – The Phils had won five in a row against the Mets before tonight’s game. Blame it on the law of averages.